The gloves came off today in Electronic Arts protracted hostile takeover effort to acquire Take Two but in a surprise twist, it wasn’t an escalation but rather a move toward a possible handshake and reconciliation. EA announced they will allow their Tender Offer to expire tonight at midnight as planned. Take Two, in turn, will include EA in their discussions about “Strategic Alternatives.” As part of that dialogue, Take Two will provide EA with a formal presentation that includes non public product pipeline and financial projections. The two companies talking amicably opens the door to the prospect of a possible friendly acquisition. When EA set out to acquire Take Two in February, Take Two stock was trading near $15 a share. EA’s offer was predicated on two deadlines, one soft and one firm. The first was the ambitious hope reach an agreement before Take Two’s blockbuster title, Grand Theft Auto, debuted at retail. 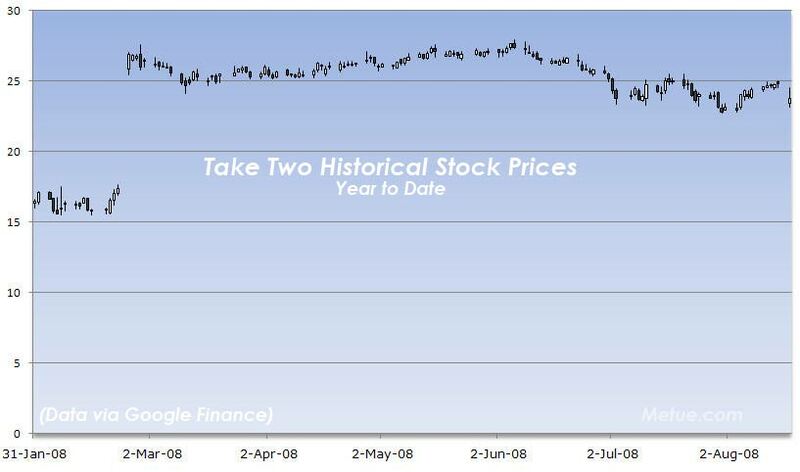 Such an opportunistic agreement would have mitigated the effects of the games retail performance on speculative stock trading, and by extension, also made shareholder approval easier to obtain (Speculative trading based on strong retail numbers can drive up the stocks price beyond what might be a fundamentally sound valuation. The elevated share prices, in turn raise shareholder expectations). EA’s second deadline was the holiday shopping season when the bulk of the gaming industry’s sales occur. EA wanted to close any acquisition, and hopefully have it be accretive, prior to that period. The first deadline came and went and now the second one borders on being impossible too (It took Activision from December to July to close their merger with Vivendi Games). With neither attainable, the urgency to complete the deal is gone. Take Two shareholders hoping for continued independence don’t have cause to celebrate just yet, however. EA’s decision to let the Tender Offer lapse, and the companies’ willingness to talk, doesn’t mean a deal (either friendly, or hostile) won’t happen. From here a potential deal could go in a number of different directions. One option is a friendly merger. With common ground in sports games, and major brands on both sides, a combination would bring substantial value to both companies through cost savings, consolidated marketing and distribution, and the joint product catalog. The deal would also return EA (and with them Take Two) to the throne as the world’s largest independent publisher. (A seat lost by the combination of Activision and Vivendi Games into Activision Blizzard. Deal closed in July). A second option is a return to hostile territory. Simply stated – allowing the Tender Offer to lapse doesn’t preclude EA from making another attempt down the road. 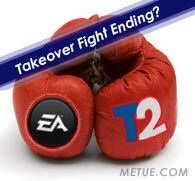 A third option is that EA walks away and Take Two remains independent, or alternately puts together some other combination with another partner (there are only a few companies that can afford to acquire Take Two at upwards of $2b but a merger of peers isn’t ruled out as an alternate prospect). Speculation among many watchers is already divided between the three prospects. Some believe a temporary walkaway (with the threat of it being final) will fuel an adjustment in Take Two’s market value as speculators who bet on the merger liquidate their stock positions. Other’s believe there’s sufficient value in Take Two’s assets (and game pipeline) to stall any stock sell off. As for alternate deals, opinions vary as to the prospects. Of the most talked about: within gaming publishers- Activision Blizzard is generally ruled out. They’re too busy with their own transaction. Rivals like THQ or Midway don’t appear to have the wealth or financial health. Ubisoft is thought to be focusing elsewhere. At the console level, Microsoft and Sony are thought to be trying to offload game development expense rather than take it on. The biggest prospect, some think, is conglomerates like Viacom or Time Warner but they may not want the expense or post-merger integration challenges. Projecting where things go now is a matter of tea leaves and crystal balls. One fact of note that is significant: Thursday the FTC’s antitrust review of EA’s proposal will be completed. Assuming no issues are raised, which is the expectation, the absence of the barrier could fast track a potential deal – either one that’s friendly, or by way of a refilled Tender Offer. It can be difficult for the two sides of a hostile business deal to put aside their issues and work together on a mutually beneficial relationship. Too much bad blood can be difficult to work around. For that reason, Rupert Murdoch predicted Yahoo and Microsoft would not find a way back to the deal table. Here, with EA and Take Two, the same logic could be applied. In predicting the outcome, however, I’d put odds slightly in favor of a deal. EA reportedly has good relationships with some of Take Two’s top development studios (notably Rock Star). EA also has a tremendous appetite for this transaction to occur. Both Strauss Zelnick and John Riccitiello are experienced executives with significant firsthand experience dealing with M&A transactions. If a creative solution can be reached, they have the tools to get there. As it should, it will likely come down to price. The following is the text of letters exchanged between EA and Take Two to set up their new dialogue. Related articles from Metue covering the transaction can be found listed after the jump. we can integrate Take-Two ahead of the important holiday season. presentation as outlined in your letter. IV, and we are happy to include EA now. understand better the value of our Company to EA. With my best personal regards.